Although it’s not officially called the Lochte Rule, it might as well be. Ryan Lochte’s now famous dolphin kicking on his back on the freestyle leg of the 200 IM final at the World Championships is the only possible reason for FINA’s announcement that it will soon disallow it. You can see the race HERE as well as video highlights the underwater portion from a few angles. What is unprecedented is the speed of this ruling. It took roughly 3 weeks from the time of Lochte’s gold medal 200 IM swim to the time FINA announced that they will soon be making dolphin kicking on the back illegal for the freestyle leg on individual medley races (and presumably medley relay races). All of this raises a key question. What bothered FINA about this swim? On the surface, it didn’t seem illegal. After all, according to FINA, during an IM the freestyle leg cannot involve any breaststroke, backstroke or butterfly. SW 5.1 Freestyle means that in an event so designated the swimmer may swim in any style, except that in individual medley or medley relay events, freestyle means any style other than backstroke, breaststroke or butterfly. And since he hadn’t broken the surface on his back, it’s a real stretch to suggest that merely kicking while on your back underwater is synonymous with the stroke. And yet that is exactly what FINA seems to want. If we look at past rule changes, there is some consistency and rationality in the reasons for the new rules. The many breaststroke underwater rule changes have typically been about the inability to catch cheaters. The 2004-5 Kitajima rule was created simply because officials couldn’t adequately observe dolphin kicking by swimmers in the middle of the pool. Similarly the recent Dec. ’14 ruling was about the difficulty officials faced in detecting whether the dolphin kick started before the separation of the hands on the underwater pull. The 1999 ruling declaring that a false start by one swimmer would not require the whole heat to restart the race was mainly to save time, while also reducing stress on the other swimmers. The 1988 10 metre underwater limitation for backstroke events (extended to 15 m in 1991), and the 1998 extensions of this limitation to butterfly and freestyle were primarily for 2 reasons: swimmer safety (extended underwater training and competing is dangerous), and because races that are primarily underwater stop becoming a spectator sport. The 1956 ruling limiting swimmers to one breaststroke cycle underwater was for the same reason as above: safety, and the loss of spectator appeal. But this impending Lochte rule has none of those elements. Lochte’s new underwater technique is safe, isn’t hidden from officials, doesn’t change the spectator experience, and is faster. From past experience FINA should love this innovation. At the moment I can’t figure out why they don’t. So What Made Lochte Go Faster? This is going to sound boring, but Lochte made this new technique work by spending a LOT of time working on it. It’s long been known that dolphin kick on your side (fish kick) or your back is faster than dolphin kick on your front. There are many theories as to why this is so, but my favourite theory is based on the concept that the upward and downward kicks need to be of equal force in order to generate the most speed. Ryan Atkinson has done some excellent analysis and explanation of this concept (here). When on your back, gravity aids the weak backward kick, and hinders the much stronger forward kick, making it much easier to equalize the two kicks. This is not the case when kicking on your side, when gravity treats both kicks the same, or kicking on your front when gravity aids the strong kick and hinders the weak kick. But none of this is new information, so there much be more to what Lochte has achieved. And here’s where I start to speculate. 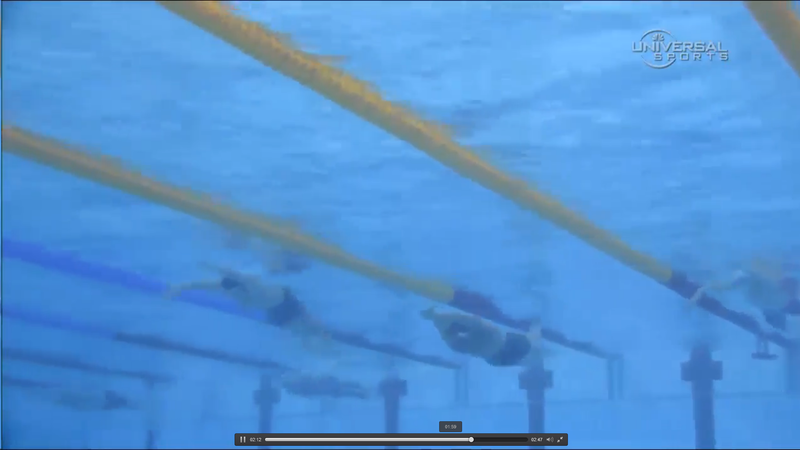 There are 2 other factors affecting the overall underwater speed: depth, and rotational transitions. 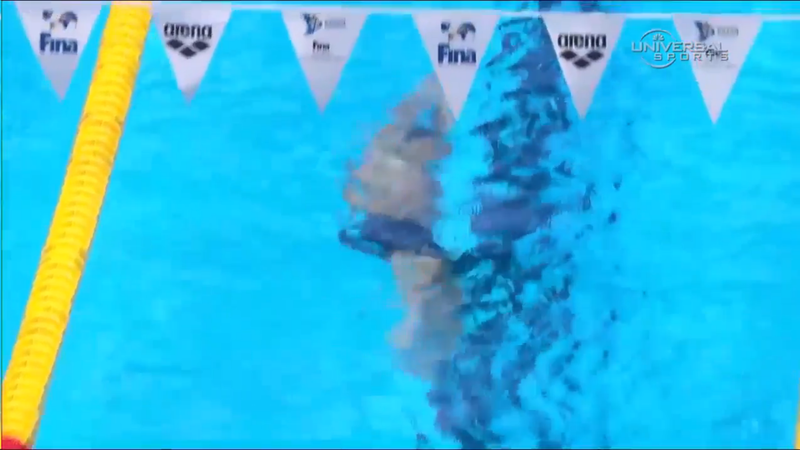 It is possible that a non-rotated front to back turn allows a swimmer to get deeper much faster than a typical breast-free turn because no long-axis rotation is required on the wall. By simply adjusting the height of the foot placement on the wall, the swimmer can push at an angle to get deeper very quickly. Traditionally, we’ve been told that the swimmer should be at least 0.5 m below the surface in order to minimize loss of speed due to water-air energy transfer, although deeper is better. The screen grab below (and the video) clearly shows that Lochte is not only much deeper than Pereira, but that he’s much deeper right away. And by getting deeper, more of the energy of his kick went into propulsion. Rotational transitions have been the source of a lot of debate over the years. I remember reading an article years ago that said a swimmer kicking on their side should suspend kicking during the transition to the front. I’ve never understood the rationale for a complete cessation of kicking, other than inexperienced swimmers often go off course during the transition. Even a small angle change is enough to make a big difference in x-axis speed. 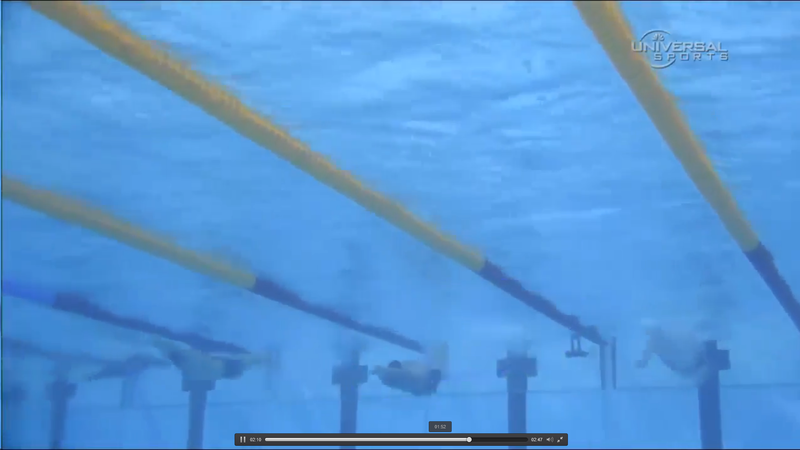 If you check out the top view of the video (provided right after the underwater view), you can see that Lochte handles the complete back-to-side-to-front transition without even the smallest deviation. What Lochte has shown is that with practice, this technique can be mastered. So is Lochte’s new underwater trick unfair or bad for the sport? I honestly can’t see how. It will be very interesting to hear FINA’s thinking on this issue, if they ever provide it. I wonder if it’s like the tech suits; not everyone can compete in the same way, so it’s off the table. That’s a really interesting idea, Drew. I would hate for that to be their reason, but it’s certainly true that very few have underwater kicks as good as Lochte’s, or have as much control as Lochte. Isn’t that what makes The Best, though? I mean, are we going to put restrictions on Phelps next because other swimmers can’t do something as well as he can? From our point of view, FINA disallowing this is all kinds of wrong. The difficulty is trying to figure out how FINA could possibly justify such a decision. Please note: The correct interpretation of the rule in this case is SW 9.1 (IM rules) not 5.1 which states that a swimmer MUST swim a quarter(1/4) of each leg in a different style. Swimming on the back after you leave the wall is clearly backstroke and only backstroke. Thank you. The problem here is that it is an assumption that being on your back underwater is swimming backstroke. Nowhere in the rules is the definition of swimming backstroke provided, other than what the swimmer has to do after they have surfaced. And if it isn’t in the rules, then it’s open to interpretation. It appears that FINA may be tightening that up. An interesting question though is how this ruling will be worded. If merely being on your back is disallowed, then we can probably expect to see an incredible number of DQs for novice swimmers as they don’t rotate 90 degrees off their BR-FR turn. We’ve all seen this. Or is FINA going to say that kicking while on your back is disallowed? Adding the kicking part probably makes more sense from an officiating point of view. To me though, the real question is why they are going to disallow this at all. It’s an interesting innovation that involves a skill that must be mastered, and increases speed. Thats like saying that kicking fly underwater is really swimming sidestroke, which is rediculous! On your side of course. Underwater fly kick on the back has always been associated with backstroke, but underwater fly on the side has not been considered illegal for backstroke nor freestyle. To “Anonymous”…Why then, at the most basic level, are kids taught to flip straight over onto their back, push off on their back, and then rotate over? Its not backstroke. Underwater dolphin kick has legally been a part of the four strokes for some time now. If they really cared that much about the strictness of the orientation of ones body, they would disallow turning onto the stomach with a Freestyle stroke before the backstroke flip turn. What Lochte is doing is less a breach of the integrity of the stroke than the backstroke flip turn process. Coach Ned, that is an excellent reply!